This is the first time that I have tried writing a developer diary. So I would really appreciate it if you could let me know if you find it useful. I find when I start building an Azure based application that I forget what I had to do the last time. At the moment, my career has been working a lot with SharePoint and I want to move over to doing more Azure stuff. However, until I actually start doing more Azure applications then the process of building applications in Azure is not going to flow. So this diary is for me to remind myself of what I did, plus I want to be completely transparent. When I find a problem or hit a blocker (no matter how stupid it is) I am going to try explain what it was, what I tried to do to fix it and hopefully the final fix. It should be interesting to see where the application goes. Well currently I use a product called Microsoft InfoPath to manage my invoices to customers. InfoPath is no longer being worked on and Microsoft have said that it will not be supported after 2023 I thought why don’t I build something that a find useful and use that as an experience to learn. So here we are. So we are going to build an Invoice management system, which allows someone to create, edit, view and publish an Invoice as a PDF into a SharePoint Online document library. There are a load of other things that I am thinking about that would be useful, like reminders to send out invoices and being able to integrate with time management applications like Toogle and create invoices from those data endpoints. 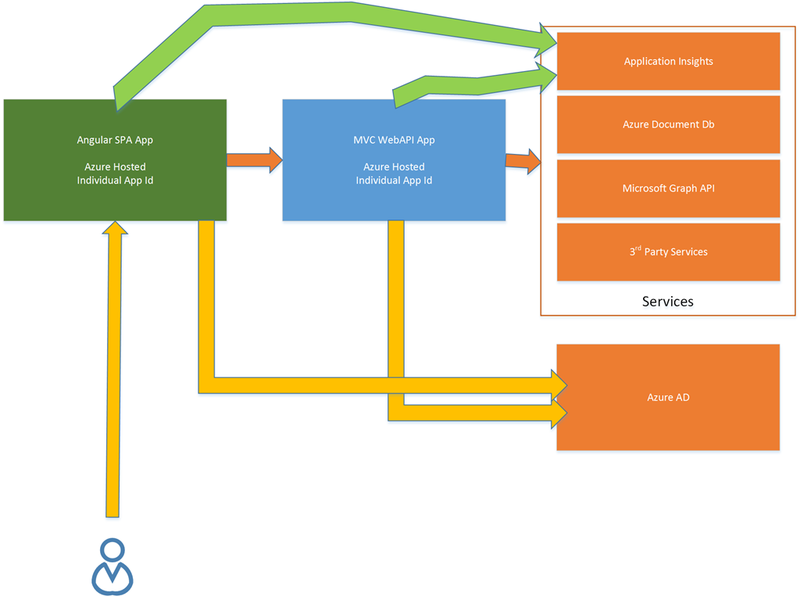 Client side Angular SPA application served by Azure Web Apps. The application will use Azure AD as the authentication and authorisation engine. For monitoring, errors, statistics we will use Application Insights and both the Angular and MVC components will use the same Application Insight key so that we keep all the monitoring together. Before I started the application I wanted to do some reading on Angular, Azure Document Db as I have never built anything with these technologies before. I am building this application with Visual Studio Code for the client side and Visual Studio 2015 for the MVC Web API component. I wanted to build something with Visual Studio Code so that I learnt more about Node, Node Package Manager, Bower, Gulp etc. I don’t really know what all those things are but we will find out! So the next steps are to create the solutions for the Angular application and the MVC Web API. That will explained in the next entry. A few people have posted comments about the script not working for SharePoint 2010. This code was built for SharePoint 2007. However I have been through the code and an updated version can be found below. Apologies that it has taken a while to respond. One of our clients wanted a way to ensure that Adobe PDF’s did not open in the current browser window. By default a PDF opened into Adobe Acrobat will open in the current browser window. This presents a usability problem as user’s lose the reference to the site they were in also other applications, such as Word and Excel, do not behave in this way. Visual Studio Tip: Using SharePoint Site Url in Pre-Deployment and Post-Deployment scripts. Within Visual Studio 2010 SharePoint projects you might want to use the SharePoint Site Url that you have specified for your SharePoint project in Pre or Post Deployment scripts. The SharePoint Site Url value can be retrieved using the $(SharePointSiteUrl) variable. For example, this variable could be used in a pre-deployment script to deactivate certain features for the debug configuration. Add the following script to the Pre Deployment Script text box. Visual Studio SharePoint Packaging Issue: Both "SharePointItem" and "SharePointItem" contains a file that deploys to the same Package location. I have had this problem a few times when moving and copying SharePoint SPI objects within Visual Studio 2010. The problem occurs because two of the SharePoint Project Item (SPI) have references to the same location. This seems to occur when you copy SharePoint Project Items. If you take a look at the SharePointProjectItem.spdata file for the SharePoint Project Item that you copied from the SharePoint Point Item specified in the [Location] portion of the error message you will see that the SharePointProjectItem.spdata file will show details of the old SharePoint Project Item rather then the new SharePoint Item. 2: <ProjectItemType="Microsoft.VisualStudio.SharePoint.SiteDefinition" DefaultFile="onet.xml" SupportedTrustLevels="FullTrust" SupportedDeploymentScopes="Package"
To fix this update the ProjectItemFileSource element’s Target attribute to point to the correct location. Had an issue at a client where a SharePoint task list got corrupted. The issue had come about due to the list being copied using Metalogix SharePoint Migration Manager within the same site. The copy of the list had been corrupted so that if you clicked on “View All Site Content”, then clicked on the list name you were taken to the Edit List Settings page (/_layouts/listaspx.aspx?List=[GuidOfList]). Once in the list settings page, clicking on the breadcrumb to take you back to the list would take you to the web application homepage. The fix was actually quite straightforward, if you typed in the url of the list correctly, http://sharepointsiteurl/sites/site/lists/My%20List%20Name, you could access the default list view with no problem. So I used a similar method to fix that I have used in this blog post, Manage Content and Structure error. Delete the list using List Settings->Delete this list. Voila! The link within “View All Site content” is now working as expected. So I have already written this blog post once, but Windows Update decided to reboot as I was finishing the blog post. Unfortunately I hit Ctrl + V as it asked if I wanted to save the post – then it rebooted. Windows Live Writer has an auto save post function, I have now enabled this to save further frustrations. Shame it’s not on by default! Anyway so what did I write..? Unfortunately this wasn’t the case. So what happened? Well I updated the solution and loaded up the SharePoint site and nothing had changed. “Ah ha” I thought it’s probably because IE is caching the CSS file. So pressed CTRL+F5 to expire the cache the page loaded again with no change. Using the IE developer toolbar I selected the element and used trace style to find out why the CSS class hadn’t changed. The toolbar opened up a strangely named CSS file called ITSP1001-65001.css. Looking at the CSS styles I could see that yep, the style hadn’t changed. So what the heck was this file? I certainly hadn’t created it and its not in my THEME folder inside c:\program files\common files\microsoft\web server extensions\12\template\themes\THEME. I discovered that the file is automatically created when a theme is applied. This creates a file using the first 4 letters of the THEME name with 1001-65001.css appended to the end. This file along with the rest of the files from the Theme folder is uploaded into a folder _theme/THEMENAME found at the root of the site. You can see this folder in SharePoint Designer. So because this file is only created when you apply a theme that is why it was not updated when the solution updated. So I applied the theme again and still no luck! It turns out that you need to apply another theme first such as CLASSIC and then reapply your custom theme. Tada the theme is now updated! Unfortunately the process of reapplying the theme is tedious but fortunately Gary LaPointe’s stsadm extensions came to the rescue in the form of stsadm –o gl-applytheme (http://stsadm.blogspot.com/2008/01/apply-theme.html). Once all the changes had been made then all the sites needed to be updated, not a fun task! Once again the stsadm –o gl-applytheme came to the rescue in the form of a recursive option. Using the stsadm command with the recursive option all the SharePoint site collection were updated in no time. I hope that this post helped, if you have any questions or there is something that you need more info on then just leave a comment.